Well, just in case you didn’t hear, an information technology officer has been accused of bank fraud. 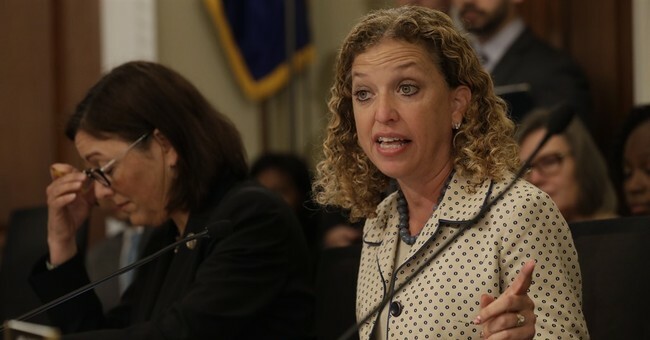 He tried to flee the country, and now Rep. Debbie Wasserman Schultz’s (D-FL) office has finally fired the aide, despite this person being under investigation since last winter. His termination was made official on Tuesday. Imran Awan is the name of the subject in question. The Capitol Police launched a probe, where he’s been accused of “serious, potentially illegal, violations on the House IT network.” He also provided technical assistance to other Democratic members of Congress. It was a family affair as well. As Jenn noted over the weekend, his two brothers, along with two of their wives, also worked for members of Congress. Imran moved out of his house in Virginia when he found out he was under investigation last February. He rented the home to a Marine Corps veteran and his wife, a naval officer, who found hard drives that Awan had reportedly tried to destroy. The FBI now has possession of those drives. Jenn added that Imran tried to enter the home to retrieve them, though the Marine refused entry. Awan, an IT staffer who has worked for many House Democrats and was employed by Wasserman Schultz, was allegedly at the center of a scheme that involved double-charging the House for IT equipment, and may also have exposed House information online, according to Fox. Awan and his family have reportedly worked for House Democrats for years. He declared bankruptcy in 2012, but has made millions of dollars on the House payroll over at least a decade of work for various members, according to a Politico report. In March, a group of House Democrats fired Awan and one other staffer over their alleged involvement in the scheme and the looming criminal investigation. However, Fox News reported Tuesday that Wasserman Schultz still has Awan on her staff's payroll despite him being barred from accessing the House's computer system since February. ABC’s Good Morning America and NBC’s Today continued on Wednesday morning the liberal media’s attempts to help Congresswoman Debbie Wasserman Schultz (Fl.) cover up the scandal involving now-fired I.T. staffer Imran Awan after his arrested Monday when he tried to flee the country. After all three ignored the story until Wednesday, CBS This Morning arrived at the scene, albeit it with a 37-second news brief by co-host Gayle King that only scratched the surface on this scandal concerning Awan and his family. As The Daily Caller has reported for months, Awan and his family have provided I.T. services to not just Wasserman Schultz but prominent congressional Democrats across key committees such as the House Intelligence Committee. The news outlet also found that Awan and his brother secretly took $100,000 of Iraqi money, owed money to an Iraqi politician who’s been linked to Hezbollah, and possibly kept their stepmother “in ‘capivity’” for better access to offshore money. Awan’s attorney is blaming the media attention on “anti-Muslim bigotry.” Awan is from Pakistan. Awan, who lives in Lorton, Va., was arraigned Tuesday on charges of bank fraud for allegedly attempting to get a loan from the Congressional Federal Credit Union on a rental property by claiming it as his primary residence. He pleaded not guilty. His passport was confiscated and he was outfitted with a GPS monitoring device. Awan's wife, Hina Alvi, flew to Pakistan in March with the couple's three children. A federal court complaint, which noted the children had been abruptly taken out of school in Virginia, said an examination of her luggage found she was carrying $12,400 in cash. She was allowed to leave for Pakistan.